Trapping moles is invariably more labour intensive than other control methods, usually requiring two or more visits by the mole catcher. Nonetheless, traditional molecatchers are relieved of many of the cost overheads incurred by general pest control firms; which often can offset the cost of time spent by the mole catcher in setting traps and checking for catches. Mole catchers use equipment that is relatively inexpensive, is re-usable, and that is more environmentally friendly than chemical-based alternatives such as poisons. Mole Begone offers a poison-free mole control service covering east and mid Bedfordshire, and part of north Hertfordshire and south Cambridgeshire. 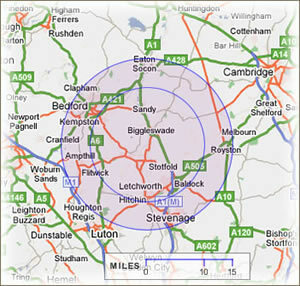 ... and all villages in the highlighted area of the map to the left. Although generally regarded as pests, moles do not automatically represent a Public Health hazard in the way that do other pests such as rats and mice. In most circumstances, the presence of a mole is only perceived (and regarded as a problem) through the expelling of loose earth to the surface as the mole excavates his tunnels. Often that represents merely an aesthetic inconvenience through the appearance of molehills or other visible disturbance. In some purpose-specific environments however the mole's activities can significantly increase the risk of mishap or injury to people, and to animals such as horses in paddocks. Mole activity, if neglected, can impact heavily on the economic usability and viability of land: particularly land which is managed and maintained to meet with the specific requirements of amenity or commercial interests.